100th Etsy Sale Giveaway Party! 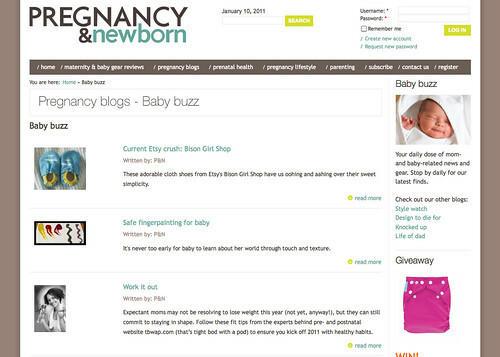 I've been a busy bee making and promoting Bison Booties the last few weeks and it is really paying off. We hit our 100th Etsy sale last week! To enter the giveaways, visit my Facebook page. My last blog post was ohhh, about 2.5 months ago. I wrote about the opening of my little Bison Girl (Bison Bootie) store on Etsy. ... have a Facebook page! And to top that off, I have sold over 40 pairs of booties! That means there are over 40 babies out there with warm toes thanks to my handiwork. 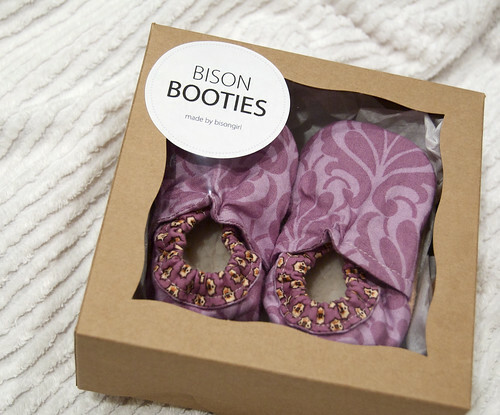 Bison Booties are now available for wholesale! I'm working with one store right now, but I'd be delighted to work with more retailers. So, if you know of a shop that would be a good fit for my booties, please let me know. 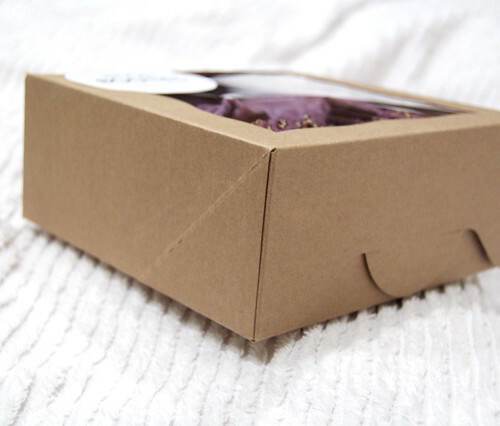 The packaging is coming together nicely after many Google searches for the perfect boxes. I think I found them. I still need to polish up the logo and I'm waiting on some little size stickers to arrive, but here is the first draft of Bison Bootie retail packaging. I can only wonder what the next 2.5 months will bring! Big announcement: Bison Girl has an Etsy store! 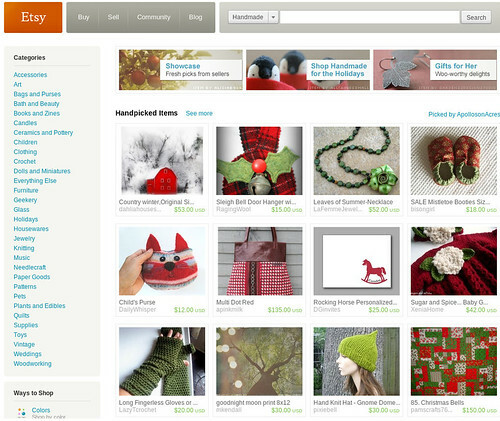 If you are not familiar with Etsy, it is a marketplace for homemade goods, materials, and vintage/antique items. In short, it is way cool. 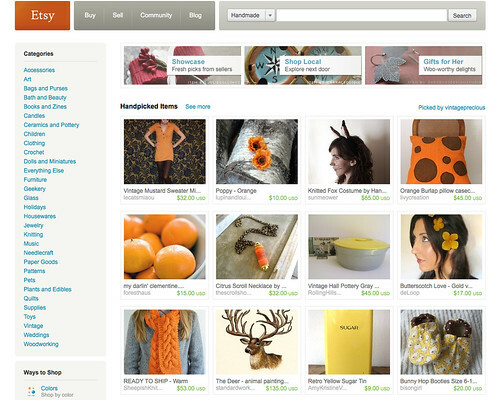 So what is Bison Girl selling on Etsy?! Bison Booties, but of course. I made my first pair of baby booties when I was pregnant with our daughter. At the time I had no clue how much wear she'd get out of them. Luckily, I made two pairs ahead of time. 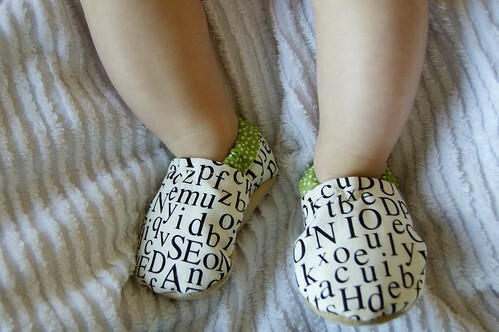 From birth to today, she wears her booties during every outing and most days she wears them at home too. We have hard floors, so without her booties, her toes get chilled. Fast forward to today ... I have modified the pattern to my liking. 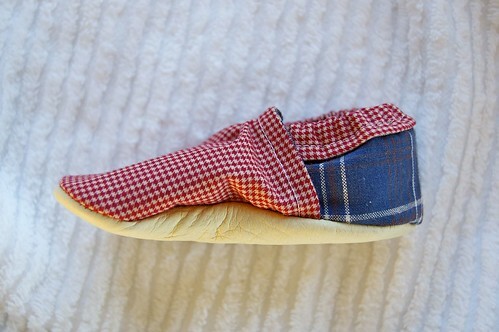 I have also up-sized it for babies 6 months old and beyond (because I could not imagine a world without these perfect little booties). I can't keep all these great booties for myself. I have to let the world in on this secret. 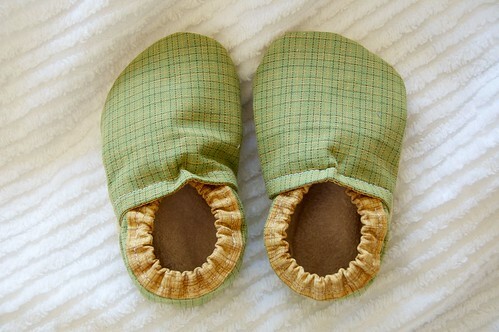 They are fully lined and have a covered elastic back, so they comfortably stay on active little feet. On the inside, baby's feet rest on cuddly faux sherpa, which does a great job keeping the toes toasty warm. As an added bonus, the booties are considered to be "soft shoes" - which are best for infant/toddler foot development and balance. As for style, I am chipping away at my stash of quilt fabric, so each pair of booties is made of high quality, designer material. Currently I make two sizes (but I will expand this soon). 0-6 month booties measure 4 inches from toe to heel. 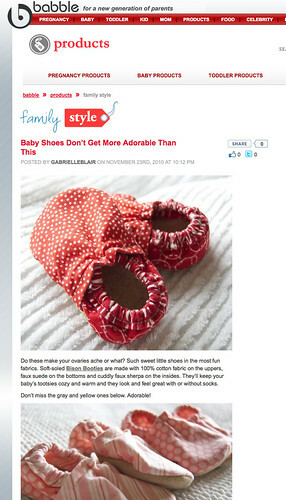 This size has faux suede or fabric under the shoe since at this age the baby will not be walking. 6-12 month booties are 4.75 inches from toe to heel. This model is designed for maximum safety of unsteady feet, so the under side has vintage deer leather (or another similar super non-slip surface). 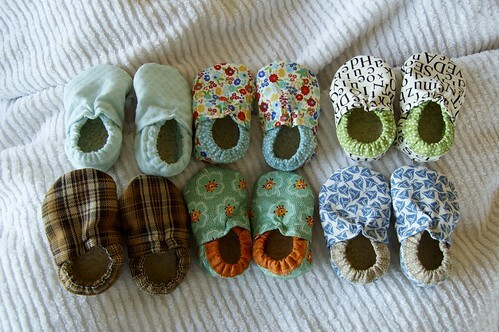 Since the booties are made individually by hand, the sizes my vary a bit. For the best sizing, measure the baby's foot and add 1/4 inch. When in doubt, order up. The 0-6 month size would make a great new baby gift, especially for infants born in the fall/winter. And I have booties for boys and girls! 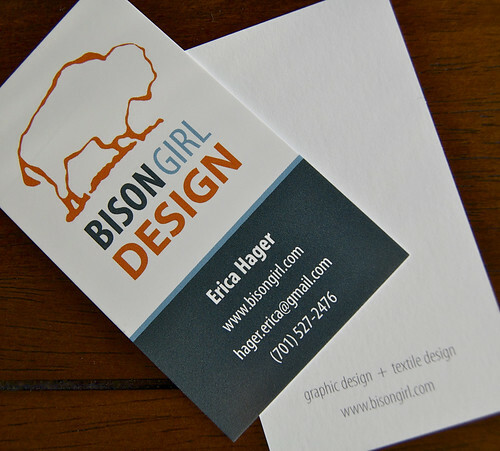 Now showing: Bison Girl Design business cards! This is the front/back design. I have over 1,000 of them... do you think our trick-or-treaters would like one with their candy? This week I started unpacking my sewing studio. I couldn't help but immediately dive right back into sewing. These Bison Booties are for a special baby boy and girl. My daughter wears her shoes like this everyday. They are the only things that stay on her busy feet. I am thinking about pursuing the idea of making and selling these booties, but I need to perfect the pattern and design first. I'm close ... really close. Stay tuned.